We get some really nice reviews from some really nice people. We have a good time up here. If the beauty and fun you are seeking are not already nearby, we are on the way to where it is. Our two story lodge remodeling is nearly complete; inside is almost done and outside is right behind with final landscaping coming in the Spring. We have three comfortable and spacious basic units, four more with full kitchenettes and another three that are our Labor-of-Love Premium Suites. 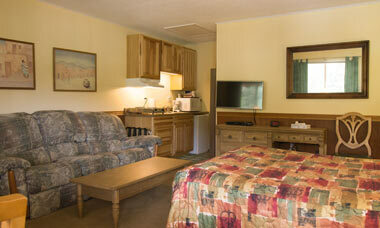 All our units are really double queen suites with two rooms, each with their own queen bed. Spacious, well appointed and well laid out, for the money, they represent a wonderful value. We are not corporate and proud of it; our setting is old but our approach is new. 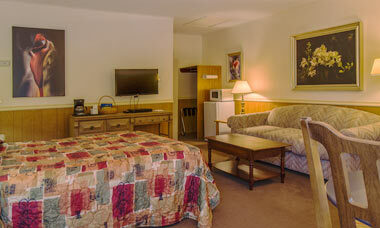 Our friendliness and cleanliness is real and, loving to share what we have, you will always be welcome here. This video comes via a new friend to the lodge, Curtis Fleming and his professional camera crew. Here to film a segment up the road at Boxwood Gulch for his popular fishing show, Fly Rod Chronicles, he and men also filmed and produced this video for us. Curtis was named the 2018 American Sportsman of the Year and, shortly after, inducted into the Fly Fishing Hall of Fame! Reservations being made with 24 hours of check-in PLEASE be by phone (to give us some response time please). 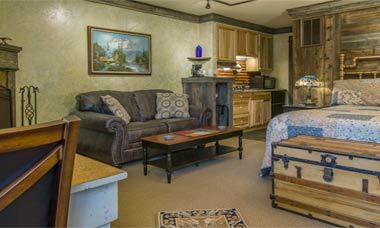 Our suite layout; click image to enlarge.